It's with a massive sense of gratitude that we'd like to thank everyone who has booked The Del Cotton Experience over the years. Sadly, and with mixed feelings we have to announce that the band has now hung up their guitars and microphones and retired from regular gigging. In the 18 years that the band performed at weddings, corprate events, private parties, pubs and clubs the length and breadth of the country, we've met some wonderful people and been privileged to be part of the wedding celebrations for hundreds of couples. If you were one of them, please accept our heartfelt thanks. Del is busier than ever with several business interests, among them, this wonderful company, Hireaband which was built on the back of his early bookings. Again, without so many people supporting and booking the band in the early days, there would be no Hireaband. Jim continues to work with select bands offering his sound engineering skills and years of experience to those with the good sense to take advantage it. Marianne continues to perform covers and her own material in Scotland and increasingly throughout Europe. The Del Cotton Experience are regulars at the most glittering functions throughout the UK from corporate events, such as the Sunday Mail's 'Great Scot Awards', to the most memorable weddings and private functions. Their success owes as much to their attitude as to the music. They approach each performance as both professional musicians and client focused business people. This means that not only will the music be outstanding but also the often over-looked aspects such as punctuality, presentation and pleasant personalities make for a slick, hassle free experience. The three piece line up, featuring outstanding male and female vocals, is compact enough to fit in to small venues but is equally at home on the largest of stages. In fact there is hardly a major venue in Scotland where this band has not performed. All the hits from the last four decades, including current chart hits, and even a lively Gay Gordons, with the emphasis on fun and danceability. You'll recognise every song and all age groups will be catered for. From Sinatra to Stereophonics, Tom Jones to Take That, Deacon Blue to Duffy - there really is something for everyone. State of the art Bose L1 P.A. and lighting are included in any quote. Importantly their transport is meticulously maintained guaranteeing that this superb band will arrive (and on time). If playing at a wedding, the band will accommodate, where possible, your choice of first song. Our set up time is a record breaking 35 minutes from access to the venue. Volume is at the discretion of the client. The standard of dress is always appropriate to the event. Requests will be accommodated if possible. For corporate events: unfazed by celebrity guests who are always treated with respect and discretion. Impeccable behavior both on and off stage. Experienced in liaising with any technical staff. Here's a video clip of the band performing at a recent wedding - our thanks to Anne and Andy for the film. Sorry, The Del Cotton Experience doesn't have any photos right now Send us an enquiry and we'll get back to you, or check out the rest of the act profile. Dear Del & Co, Thank you all so very much for making our silver wedding party such a brilliant night! Just a note to say thank you for helping to arrange the Del Cotton Experience at short notice to play at my daughters wedding on the 22nd of August 2009. We just wanted to say a huge thank you to the Del Cotton Experience who were fantastic at our wedding. Just a quick note to say a massive thanks for Friday night. Please pass on our regards to Del and the other members of the band, they were excellent, an all round party band. I'd like to thank Del Cotton for making our night so special. The Del Cotton Experience were absolutely amazing and many of my guests are still commenting on how fantastic they were. From booking to the event, they were excellent and fabulous on the night with a mix of music to suit everyone. Del Cotton were excellent and even accommodated our friend singing and had to learn our second song - great band!! Del, we just got back from our Honeymoon and wanted to take a moment to say thank you so much for everything. The Del Cotton Expereince were absolutely fantastic. 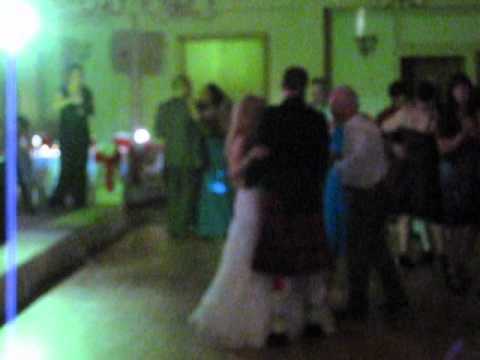 The Del Cotton Experience performed at our wedding on July 9th at the Popinjay Hotel. We would just like to than Del Cotton for a great night, he was superb & was enjoyed by everyone between the ages of 8 and 80 years old!!! Del , just a quick note to thank you for making our wedding reception great. Just a quick email, now that we are recovering(! ), to say a huge thank you for am awesome night at our wedding. I?m just writing to thank you very much for the entertainment you gave to us at the Seamill Hydro for our daughter?s Wedding Reception.